My Creative Time: Cold Days -Challenge #2 w/the Pink Stamper! Now to the 2nd challenge w/My Pink Stamper was to create something warm & springy to take our minds off this COLD weather everybody is experiencing right now! I decided to go w/a spring flower theme! I created this card using my Gyspy & the "Sweet Treats" cart. 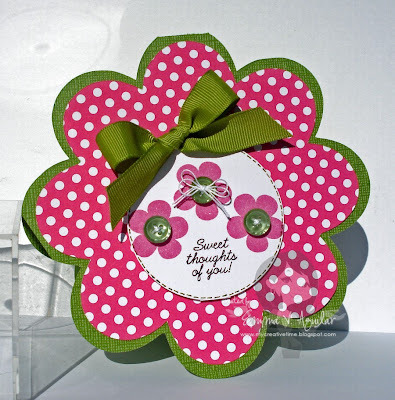 The paper I used was from Jillibean Soup, cardstock from coordinations, ribbon from Stampin up & that "Lovely" stamp image & sentiment is from "My Pink Stamper" herself! The set I used was called "Simply Sweet Occasions" I just can't get enough of this set, it has a lot of cute stamps! For my card, I also used some buttons from PTI! I thought they fit perfectly into the center of the flowers! I hope everyone has a wonderful weekend & thanks for visiting! Love this card!! Very creative. STOP IT!!!! SOOOOOOOOOOOOO CUTE!!!! ok, spill...where did you get the tiny twine for the bow in your button???? I love the colors you used!! So bright and fun. What a talent you have! !